It was a three-way in prime-time Wednesday, with NBC, CBS and Fox all on top at various points. NBC’s America’s Got Talent led all programming in total D-FW viewers, amassing 283,573 in the 7 p.m. hour. But CBS’ competing Big Brother easily bested AGT among advertiser-coveted 18-to-49-year-olds, pulling in 102,627. Fox’s 8 p.m. hour of Masterchef couldn’t come close to matching either of those numbers, but still won its time slot with 123,609 total viewers and 51,314 in the 18-to-49 age range. Fox4’s 9 p.m. local newscast, still devoted to coverage of Hurricane Harvey’s aftermath, then trampolined to 247,217 total viewers and 102,627 in the 18-to-49 realm. In the key 18-to-49 demographic, that more than tripled the total for any competing 9 p.m. program. TEGNA8 won in total viewers at 10 p.m. while Fox4 ran first with 25-to-54-year-olds (main advertiser target audience for news programming). Fox4 also swept the 6 a.m. competitions and narrowly drew the most 25-to-54-year-olds at 5 p.m.
NBC5 won in total viewers at 5 p.m. and added a 6 p.m. first with 25-to-54-year-olds. TEGNA8 had the most total viewers at 6 p.m.
NBC’s “reality competition” regulars, American Ninja Warrior and America’s Got Talent, controlled the first two hours of prime-time on Monday and Tuesday before audiences shifted to Fox4’s Hurricane Harvey-infused 9 p.m. local newscasts. AGT hit Tuesday’s high with 312,657 D-FW viewers from 7 to 9 p.m. while also leading those two hours with advertiser-coveted 18-to-49-year-olds (70,556). Fox4 was tops in total viewers at 9 p.m. with 189,048 and scored Tuesday’s prime-time high among 18-to-49-year-olds (76,970) before the station’s late-night 10 p.m. news took it up a notch to 83,385 viewers in the key 18-to-49 age range. The Texas Rangers, transplanted to Tampa Bay for their 10-2 win against the Houston Astros, drew a deflated crowd of 87,253 total viewers on Fox Sports Southwest. In Monday’s prime-time Nielsens, the Peacock network’s Ninja Warrior drew the most total viewers from 7 to 9 p.m. (159,964) and also won among 18-to-49-year-olds with 76,970 viewers. Fox4’s 9 p.m. news then set the prime-time high in total viewers (203,591) while also again winning its time slot with 18-to-49-year-olds (60,935). Over on Bravo, the third episode of Real Housewives of Dallas’s second season again drew little attention in the 9 p.m. hour. It had 40,718 total viewers, falling from the 48,716 for Bravo’s preceding dollop of Real Housewives of Orange County. Among 18-to-49-year-olds, RHOD had 19,884 viewers and Orange County, 26,298. Monday -- TEGNA8 scored twin wins at 10 p.m. in total viewers and 25-to-54-year-olds (main advertiser target audience for news programming). Fox4 swept the 6 a.m. competitions and NBC5 did likewise at 5 p.m. The 6 p.m. firsts went to TEGNA8 in total viewers and NBC5 with 25-to-54-year-olds. Tuesday -- Fox4 and TEGNA8 tied for the most total viewers at 10 p.m., but Fox4 dominated among 25-to-54-year-olds. The 6 a.m. and 5 p.m. sweeps again respectively went to Fox4 and NBC5. At 6 p.m., NBC5 led in total viewers and Fox4 was tops with 25-to-54-year-olds. CBS’ Big Brother made the competition cry uncle Thursday by easily pacing the prime-time Nielsens. Airing in the 8 p.m. hour, BB drew 218,133 D-FW viewers and 99,429 in the sainted 18-to-49-year-old age range, which most advertisers covet. CBS also won from 7 to 8 p.m. in both ratings measurements with repeats of The Big Bang Theory and Kevin Can Wait. Fox4’s local newscast then stormed into view at 9 p.m., with its Hurricane Harvey-centric coverage handily winning the hour with 152,693 total viewers and 44,899 in the 18-to-49 realm. That doubled the audience for any competing program on the Big Four broadcast networks. Another Thursday night BB, ABC’s Boy Band, again bombed as the network’s lead-off hitter with a pair of fourth place finishes. 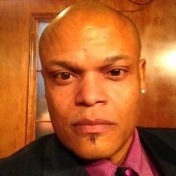 But it was a Goliath compared to CW33’s 9 p.m. hour of NewsFix, which explored new vistas in teeny tiny with 727 total viewers and 641 in the 18-to-49-year-old demographic. TEGNA8 led at 10 p.m. in both total viewers and 25-to-54-year-olds (main advertiser target audience for news programming). Fox4 likewise swept the 6 a.m. competitions and NBC5 flexed with twin wins at both 5 and 6 p.m.
Summertime’s “reality-competition” kings, NBC’s America’s Got Talent and CBS’ Big Brother traded blows Wednesday in their 7 p.m. face-off. AGT had prime-time’s biggest haul of total D-FW viewers with 247,217 while BB topped all TV attractions in the advertiser-coveted 18-to-49-year-old age range with 93,006. Fox’s Masterchef cooked the competition in the 8 p.m. hour with dual time slot wins in total viewers (152,693) and 18-to-49-year-olds (57,728). Fox4’s 9 p.m. local newscast then came up bigger, sweeping the hour with 225,404 total viewers and 70,556 in the 18-to-49 realm. CBS’ 8 p.m. entry, the disaster series Salvation, again lost the bulk of BB’s lead-in crowd, particularly among 18-to-49-year-olds. Salvation’s paltry 6,414 viewers in this key demographic amounted to barely one-fifteenth the size of its inherited audience. Fox4 cruised to easy wins at 10 p.m. in both total viewers and with 25-to-54-year-olds (main advertiser target audience for news programming). The station also swept the 6 a.m. and 5 p.m. races. At 6 p.m., TEGNA8 had the most total viewers and NBC5 won with 25-to-54-year-olds. Over the years, NBC5’s news and weather promos have tended to be more than a little “countrified,” including the past spring’s big rig/CB radio “Convoy” spot for the station’s meteorology team. But the Fort Worth-based station’s latest drumbeat might also be its most contemporary. 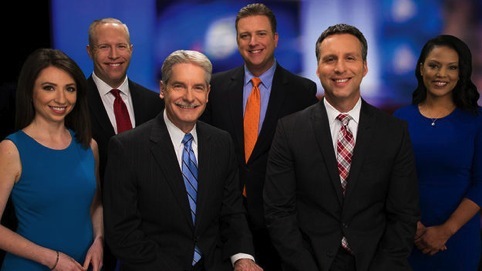 Put together by an in-house creative team headed by Gary Wann, it re-invigorates the D-FW market’s ever-combative weather wars with a deftly orchestrated newsroom spot featuring NBC5’s entire team of temperature takers. They’re variously caught in the acts of precision dart-throwing, ping-pong playing, basketball-spinning and paper wad shooting into a trash can. All six -- Rick Mitchell, David Finfrock, Samantha Davies, Grant Johnston, Brian James and newcomer Keisha Burns -- capably play their parts. Comedic elements aside, the 30-second ad otherwise touts NBC5’s “Most Accurate” designation by WeatheRate, which touts itself as “the only independent weather forecast verification company in the United States, perhaps even the world.” After comparing a market’s local TV weather forecasts with the resultant actual “observed conditions,” Phoenix-based WeatheRate picks an overall winner -- in this case, NBC5. Results are based on data compiled over a full year, with new results released each June, according to a FAQ section on the WeatheRate website. The firm also notes that it’s “not affiliated with any TV stations or the companies that own them.” But WeatheRate’s president, meteorologist Bruce A. Fixman, says the company does contact individual winning stations and offers a licensing fee deal allowing them to use WeatheRate’s logo and data in promotional spots. NBC5’s spot mentions WeatheRate and uses its logo at the end. NBC5 vice president of news Mark Ginther confirms that the station did pay WeatherRate a fee for such use. According to WeatherRate’s website, its 2015 and 2016 winner for most accurate forecasts was CBS11. The company did not include D-FW in its surveys before that. Anyway, now that you’re armed with all of these further details, enjoy the below spot. It’s not as if the world needs yet another movie or series bearing the Marvel brand. But D-FW and the Dallas Film Commission certainly could have used Fox’s The Gifted as both an economy- and morale-booster. 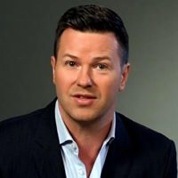 Instead, despite show runner Matt Nix’s best efforts, the mutant-rich drama series has relocated to Georgia (specifically Atlanta) for future episodes after the pilot was filmed earlier this year in Dallas. The culprit? Mainly tax incentives. Georgia has them in abundance. Texas lately does not -- and increasingly is paying a price while the nearby Peach state is now a mecca for film and TV production. Nix said it was his idea to film in Dallas after a far lengthier stay in the city for Fox’s 2010 comedy cop series The Good Guys, which co-starred Bradley Whitford and Colin Hanks. It got canceled after 20 episodes, but originated entirely from North Texas. Fox was on a “very tight timeline,” though, Burklund said. “It’s a big show. They had lots of sets to build and things to get ready. They also had an air date, and they delayed it as long as they could. But they had to make a decision because the (state) legislature wasn’t done doing their stuff” (regarding both any approval of tax incentives and a then pending “bathroom bill” which finally was killed this week). Fox initially has ordered 10 episodes of The Gifted, which is scheduled to premiere on Monday, Oct. 2nd in tandem with the network’s returning Lucifer. The series will have plenty of company in a bullish state where film and TV production reportedly had a record tax incentive-driven “economic impact” of $7.2 billion in fiscal year July 1, 2015 to June 30, 2016. Besides The Gifted, upcoming new series being filmed in Georgia include Fox’s The Resident, NBC’s Good Girls, The CW’s Valor, Black Lightening and its Dynasty reboot, ABC’s retitled Kevin (Probably) Saves the World and Netflix’s Insatiable and The Haunting. Georgia also is home to a wealth of returning series, including AMC’s The Walking Dead, FX’s Atlanta, CBS’ Macgyver, Fox’s Star and CW’s The Originals. Additionally, at least 17 feature films and 11 “reality” series have set up shop in Georgia. For now, the Dallas Film Commission mostly is licking wounds from series that got away or pilots that never made it to the next level. That includes the Reese Witherspoon-produced Broken, which was filmed in the city last year with an imposing cast that included Anna Paquin (as a “ruthless” Dallas divorce attorney), Blair Underwood and Penelope Ann Miller. But ABC took a pass after seeing the pilot for Broken. 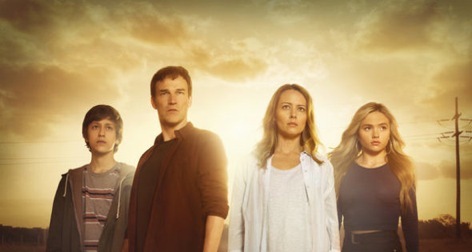 And now The Gifted has gone thataway to deepen a slump that began when TNT abruptly canceled its new version of Dallas in 2014 after a three-season run that ended with an unresolved cliffhanger. Burklund notes at least one bright spot beneath these otherwise gloomy skies. The first two seasons of USA network’s Queen of the South were filmed in Dallas and surrounding areas. USA recently picked up Queen for a third season, but it’s “yet to be seen,” Burklund said, whether the show will remain here or be lured elsewhere. Given the state legislature’s intransigence when it comes to increasing tax incentives for filmmakers, just about everything is anything but a done deal these days. CBS’ latest hour of Big Brother again dominated in the key 18-to-49-year-old demographic Wednesday by nearly doubling the audience for NBC’s competing America’s Got Talent. The network’s annual summertime collection of bickering, mostly empty-headed “houseguests” drew 105,834 D-FW viewers in the 18-to-49 realm while AGT ran a distant second in the 7 p.m. hour with 54,521. AGT edged BB in total viewers, though, by a score of 269,031 to 239,946. But networks of all sizes would much rather load up with 18-to-49-year-olds in pursuit of “premium” advertising rates. And close to half of BB’s viewership hit that sweet spot compared to barely 20 percent for AGT. NBC’s 8 to 9 p.m. double-shot premiere of Marlon Wayans’ new sitcom, Marlon, won both half-hours in both audience measurements in competition among the Big Four broadcast networks. And despite falling substantially from AGT in total viewers, Marlon nearly equaled its lead-in’s 18-to-49-year-old numbers. The first half-hour of Marlon fared the best in total viewers with 174,506; both episodes performed equally among 18-to-49-year-olds with 51,314. ABC’s three-hour CMA Festival lagged with 94,524 total viewers and just 22,450 in the 18-to-49 demographic. But this was still good enough to whip CBS’ two-hour episode of Salvation, which fell to 65,440 total viewers and a paltry 12,828 within the 18-to-49 motherlode. Fox4’s 9 p.m. local newscast continued to hold up decently in the summertime heat, beating ABC, CBS and NBC in total viewers with 123,609 and tying NBC’s Law & Order: SVU with 18-to-49-year-olds (28,864 each). In the cable universe, the rallying Texas Rangers’ pursuit of a post-season wild card spot continued to bolster the numbers for Fox Sports Southwest. The hometown nine’s win over the Detroit Tigers averaged a solid 167,235 total viewers and 35,278 in the 18-to-49 realm. The 8 to 10 p.m. portion of the game topped all prime-time programming in total viewers and also won the 9 p.m. hour among 18-to-49-year-olds. Lastly, here are Wednesday’s local news derby results. TEGNA8 had the most total viewers at 10 p.m., but NBC5 was tops with 25-to-54-year-olds (main advertiser target audience for news programming). Fox4 scored twin wins at 6 a.m. and the Peacock did likewise at 5 p.m. The 6 p.m. golds went to TEGNA8 in total viewers and NBC5 among 25-to-54-year-olds.